When I tell people about my obsession with interest in Irish whiskey, I inevitably get the question, "so, what's your favourite whiskey then?" Since its release two years ago, the answer I've been giving is Powers John's Lane Edition. It's great to be able to recommend a smashing, full-flavoured, single pot still (SPS) that's not hard to track down, and is very reasonably priced. The look of that bottle, though, was quite different to the existing Powers blends, ie the Gold Label and the 12 year old Special Reserve. The Gold Label is now getting the makeover. It still has the gold-coloured label but otherwise has fallen into step with the appearance of the John's Lane (click to enlarge the photo). A more subtle change is the bump from 40% ABV to 43.2%. This means the whiskey needs no chill-filtration before bottling, a process that prevents cloudiness at low temperatures but also removes flavour-giving compounds in the spirit. Conventional wisdom puts the cut-off ABV for rendering filtration unnecessary at 46% but the triple-distilled spirit in Powers is not so susceptible to low temps so 43.2% does the trick. I hear lips smacking in anticipation but I have bad news for Irish imbibers: the juiced-up Gold Label will only be available in international markets for the foreseeable future, while we continue with the 40% version. I can imagine why that might be so. It's deeply embedded as the number two selling whiskey here and Gold Label is one the few staples in Irish pubs along with Jameson and Bushmills. They are all priced the same. It would be risky to either change the flavour or up the cost to punters. Irish drinkers will, however, get a sniff of the new addition to the Powers line-up, Powers Signature Release. It's another single pot still, like the John's Lane, but without an age statement. I haven't sampled it yet but it sounds similar in make up to its 12-year old SPS sibling, ie mostly aged in American bourbon barrels, with just a touch of Spanish Oloroso sherry wood. We're back to 46% ABV here and, of course, it's not chill-filtered. The price for this will be about $45 in the US (compared to about $70 for the John's Lane). I don't know what it'll go for in Ireland yet. It's due to appear on shelves this month. One concern when the Signature Release first appeared was that it might be a no age statement replacement for the John's Lane. That's absolutely not the case; John's Lane is here to stay. 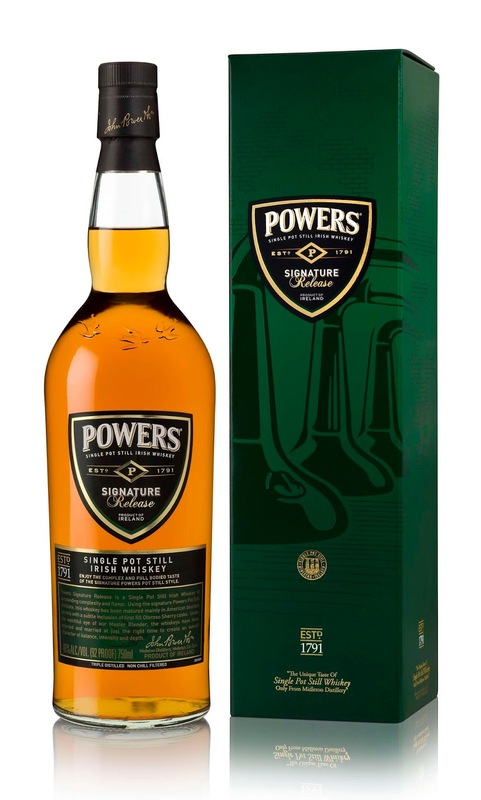 The much-liked 12 year old Powers Special Reserve blend may be gradually phased out internationally but it will continue to be sold in Ireland. Since the John's Lane is also a 12 year old, that will clarify the line up, outside Ireland anyway. There is no plan to mimic the Gold Label's ABV boost in the Special Reserve. Irish Distiller's ambition is to increase global distribution of the Powers range but that is obviously limited by current inventory (Powers uses a distinct distillate and cask profile which makes it quite different to Jameson). The recent Midleton distillery expansion will loosen capacity constraints so we should soon be sharing Powers with the world.